In my new book The Amazing Stitching Handbook for Kids, I included a glossary of lots of line drawings that kids can use for stitching guides. I stitched a bunch of them on felt from A Child's Garden. Here are some of them. 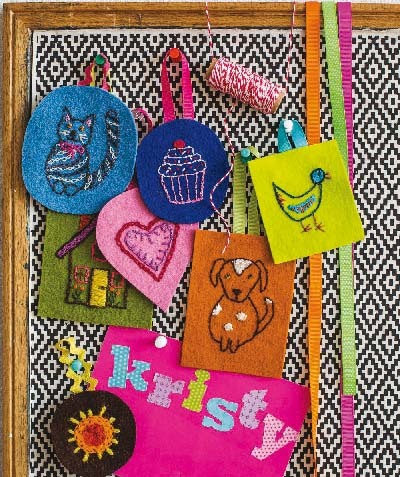 This project would be a nice teacher gift project. Check out the new book on my website here. Books begin shipping after August 5th. I'll be happy to sign them for anyone you like. $16.95 plus $4.00 shipping. 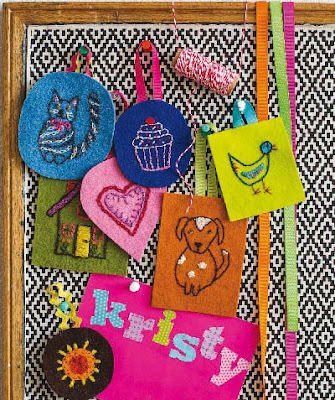 I may have to get this book for my niece just so I can work the patterns with her! Just cute things... I really want to teach my kid to sew like that.